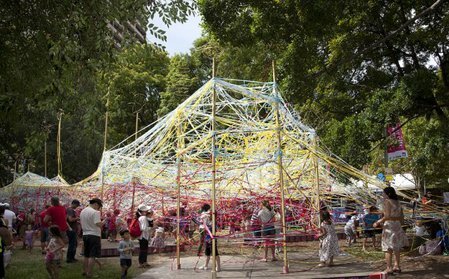 Tangle is a free fun event for the family, it basically involves unravelling pieces of brightly coloured elastic to create a playground of sorts by wrapping the elastics around the various objects provided. Run by Polyglot Theatre who are well known for their creation of interactive art for children and adults alike. Polyglot Theatre are internationally renowned and allow children to turn basic everyday items into works of art or a spectacular creation. Held in Northbridge from Thursday 21st Feb 2013 until Sunday 24th Feb 2013.